Figure 12.3. Sliding filament model of muscle action: The sarcomere is the smallest repetitive unit in skeletal muscle. 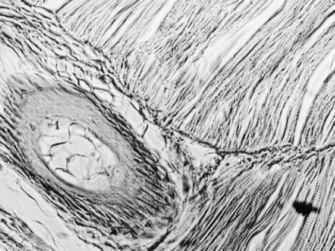 Many sarcomeres in series make a myofibril, many myofibrils in parallel fill a muscle cell (myofibre), many myofibres form a muscle. 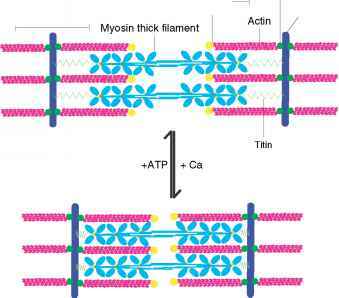 Repeated binding of myosin heads to the actin filaments leads to muscle contraction, under the influence of ATP actin is released from myosin and the muscle relaxes. Muscle strength is the result of the summed binding strength of millions of myosin heads to actin microtubules. Passive stretching of muscle is possible, but elastically resisted by titin molecule that link the thick filaments to the Z-disks. Actin microfilaments are stabilised by capping proteins, tropomod-ulin at the minus and Cap Z at the plus end. Nebulin (not shown) binds along the entire length of the microfilaments and stabilises them. The association of actin and myosin in muscle results in an actomyosin complex. The Z-disk is composed mainly of a-actinin. Figure 12.4. As a result of its structure, skeletal muscle appears striated in histological preparations (Zebrafish, HE staining). caldesmon instead of troponin. Ca-dependent phosphorylation of caldesmon and of myosin light chains is required for smooth muscle contraction. Thus smooth muscles contract much slower than skeletal muscle. 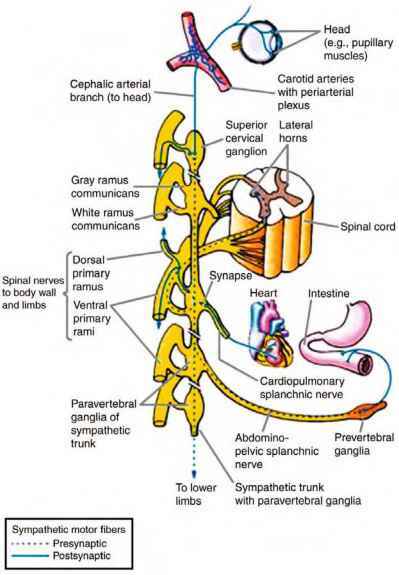 Ca-concentration in smooth muscle is regulated not only by nerve impulses, but also by hormones and growth factors. Muscle relaxation occurs when ATP-binding to myosin leads to release of bound actin. After death the ATP-stores of the cell are rapidly depleted, but actin-myosin-interactions are still possible. This results in rigor mortis, the stiffness of the dead. Only after lysosomal proteases have partially digested the muscle does it become soft again. Understanding of these processes is important for determination of the time of death in forensic medicine. There is also an everyday application of this knowledge: Meat prepared immediately after slaughter is tough and hard, "hanging" it in a cool place for a couple of days makes it softer. Alternatively, the meat may be marinated in protease-containing fruit juices (pineapple, papaya). Meat tenderizers contain such proteases in powdered form.